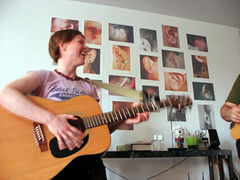 I volunteered my apartment for Brenda’s CD release party. It was wonderfully fun. There were plenty of people that I was waiting for an opportunity to invite them to something, so this helped me too. Brenda’s performance was great. That photo is from Daniel Talsky, he had a front seat.